Personality: Parius, after the battle with Ariel, has become much colder, much more serious, and much less merciful. Parius now wanders, almost aimlessly, searching for his now lost "light". He is incredibly dangerous, however, as he fell to the "abyss" present in all Ryukotei. As stated, Parius will no longer show any enemies mercy, attacking them in almost a bestial, and mindless way. He will almost never speak while in battle, preferring bestial grunts, and mindless yelling. Parius has an intense hatred for beings that he already disliked before he fell. He will instantly become berserk around beings such as Azazeal, and especially Ariel, as she was directly responsible for Parius giving into his own abyss. 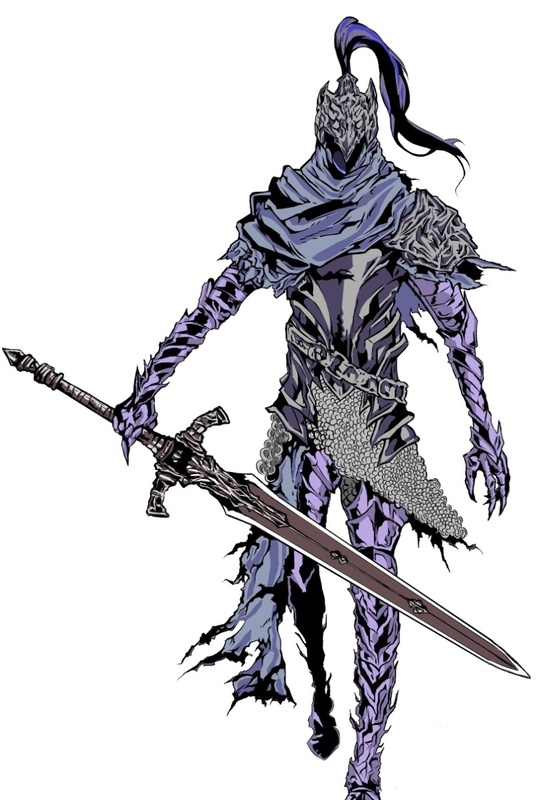 He will stop at absolutely nothing to slay both of these beings, often even attacking allies in order to kill both the being that corrupted his daughter, and the being that corrupted him. Parius is still capable of working with people, but he prefers to work alone as much as possible. He is much harder to talk to, and almost antagonizes people, simply to leave him alone. However, there are still exceptions, such as Saya, and Jensen, and any of Parius's family. Around them, he becomes a little like his old self, but not by much. Physical Traits: Parius still retains his normal appearance as he always has. 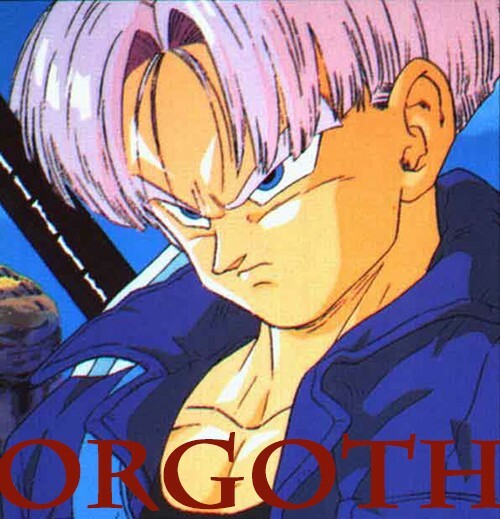 He has black hair, blue eyes, but his skin is now paler than before, and has cracks over his face, especially near his mouth. His canines are also seemingly sharper. His face is almost always hidden by his hood, however. Parius, due to his fall, is now wrapped in armor formed of his own darkness. It takes the appearance of knights armor, but mangled, and twisted. 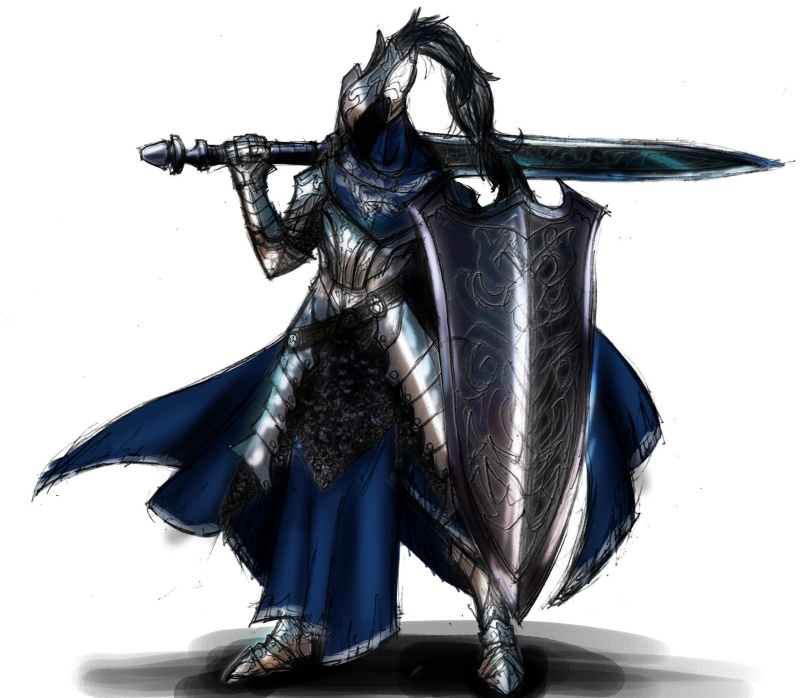 Most of the armor is grey, with blue, ripped cloth on his right hip, and wrapped around his neck, much like a scarf. there is a small piece of armor on his left arm, over the blue cloth, near his shoulder. The ends of his gauntlets also end in claws. Parius also wears a helmet, in the shape of a pointed hood, with a blue/black tassel coming out of the back, much like a high ponytail. Accessories:Parius wears a black cloak around him, when not in battle. He also keeps his sword attached to his back now. General Fighting Style: Parius is still the mostly speed-based fighter he always was. But, because of his corruption, his strikes now carry enormous power behind them, as the power Parius now possesses augmented his normal strength well beyond what it used to be. Parius usually attacks in an almost random, quick series of attacks, but he is actually trying to get past his enemies defenses, and kill them as quickly as possible. However, in his berserk rage around anything that he hates, Parius does indeed start to attack randomly, regardless of anyone around him. Speed: Parius has retained his usual brand of speedy offense. However, after the corruption, he can no longer use Shunpo. He makes this up by using his now enormous strength to push off of surfaces at near-Shunpo levels. Strength: When Parius became corrupted, he became the physical match for even the most powerful beings. He can, as stated above, push off of surfaces fast enough to keep up with Shunpo users, and can easily break concrete with his bare hands. 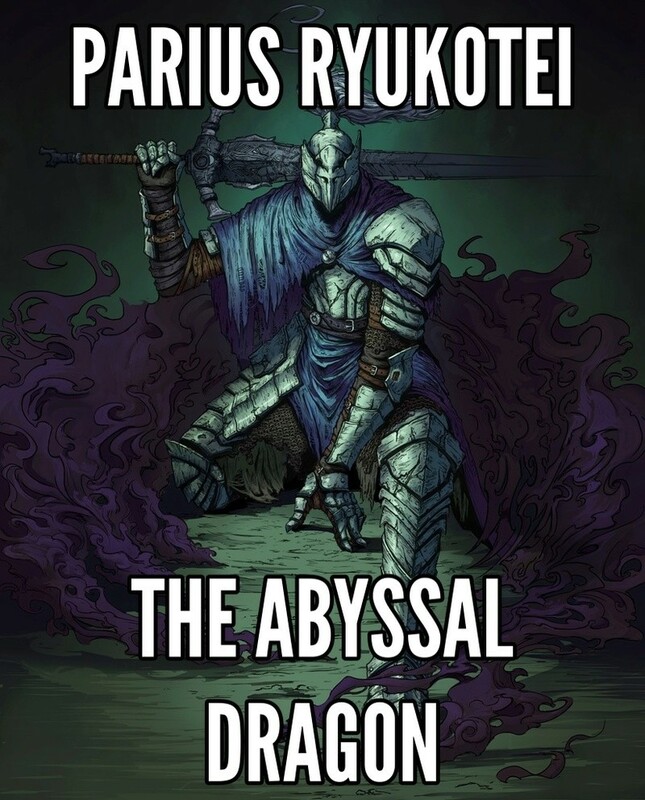 Spiritual Energy: Instead of being fueled by spiritual energy, Parius is now fueled directly by the "Abyss"- Something that Parius doesn't even really understand. However, his abilities no longer rely on Spiritual Power, which leaves Parius with little, to none. Parius is, technically, always in a Shikai-like state. Effect: Parius is able to open up walkways through the Abyss, and is able to travel between points using these walkways. He cannot use this in battle, and he is able to bring a maximum of two people with him at a time. Stage 1: The Corrosion causes slight burning in the area hit, with very minimal amount of damage, for 6 posts. Parius's blade always has this version active. Stage 3: Parius can charge it up further, for 2 posts, causing half a Cero's worth of burning damage, with a 1 post cool-down. Effect: Parius crouches, then leaps high into the air towards his opponent, before slashing down, causing damage in a small area-of-effect around him when his blade hits the ground, and it has a range of up to 3 feet. It's as powerful as a Cero, while in Shin'en no Senshi, it is as powerful as 3 Cero's. 1 post cool-down, Powered up version is a 2 post cool-down. Effect: Parius somersaults into the air after which he slams his sword down vertically. He can repeat this up to three times, and each hit causes abyssal energy to explode out, up to 3 feet outwards, and each strike is Cero powered, and can knock opponents back. In Shin'en no Senshi, it is as powerful as 3 Cero's. 1 post col-down normally, 2 post cool-down for the powered up version. Effect: Parius moves toward his opponent while swinging his sword 360 degrees, causing a wave of abyss energy to also be shot out around him, up to 25 feet. The abyssal energy moves as fast as a Cero, with the power of one. In his Shin'en no Senshi, it is as powerful as 3 Cero. 1 post cool-down normally, 2 post cool-down with the powered up version. Effect: Parius charges his abyss energy, before shooting it out at an opponent. As powerful as a Gran Rey Cero, 3 post cool-down. While in Shin'en no Senshi, it's as powerful as 2 Gran Rey Cero. 5 post cool-down. Parius is at Toukai level, and retains his abilities from above. His shield is also able to block released Zanpakuto level blades. Effect: Parius is able to phase his body, into a intangible form, basically allowing 1 attack to phase through him. He has to have a cool-down of 3 posts after using it one time. He can't phase through finals. Effect: Parius uses the shield on his left arm, and is able to block attacks up to 2 Gran Rey Cero's in strength. 5 post cool-down. Effect: Parius unleashes the full fury of the Abyss upon his opponents, blasting them with a attack powerful enough to take out a city block. Final move, so fatigue state right after using it. When Parius was alive, he led a good life in Tokyo, Japan. He had many friends, and had a great family. However, he came down with an illness at 17. It was something the doctors had never seen before. They said he would be dead within the week. But, to the disbelief of his doctors, Parius managed survive. He fought, and fought, untli his 18th birthday. That day, he had a talk with his father. He said "You've been through alot, and I know the doctors have not come up with a cure. You just need to hold on, my boy." Parius chuckled at that, and said "I know, father. I know" Later that day, Parius died, with a smile on his face, and all his family there. He found himself outside of his body, with a broken chain on his chest. He soon found out that he could pass through the walls. He said goodbye to his family, though they didnt seem to hear him, and left. Parius enjoyed himself. He wandered for hours, just looking at things that peeked his intrest. When he finally stopped looking around, he noticed it was the middle of the night. Then, a chill went up his spine. He turned, only to find a monster behind him. Parius ran, but the beast was always behind him. He knew it would catch him, so he dove into the nearest alleyway. The monster looked around, and roared in rage that it couldn't find its prey. Parius thought he had gotten away, when it looked into the alley, and started towards him. Parius thought it had seen him, when he heard a whimper behind him. He looked back, to see an older man, with a chain, like his. Then he realized the monster was going for him, instead of Parius. I can't let this happen. Parius thought. Looking back to the monster to see that it was almost at the opening, he knew he had one chance. Parius sprang from where he was, and ran past the beast, looking back long enough to see that it had taken the bait. Parius ran for a bit longer, before stopping at an desolite construction site. He turned, knowing he was going to die again. He closed his eyes, waiting for pain. It never came. Parius heard a yell, and opened his eyes. He saw a man, wearing very old clothes. The man turned to him, and said "It's time to go." Parius nodded, thinking "This must be that Konsō, I've heard about." The man used the end of his sword, and lightly tapped him in the head. Parius felt strange, and fell asleep. When he woke, he found himself in a town, modeled after Fuedal Japan. After walking a bit, he came to a clearing, much like the parks in the Human World. He came across a group of kids, around his age, just sitting around a campfire. Seeing no other alternative, Parius asked to join them. One of them, a boy with spiky, blonde hair, jumped up, and started harrasing him. Parius had no idea what he had done to the boy, and tried to apologize. The boy then struck him, and stared. Parius had no idea what to do, when a man got up, and came over. The boy backed off, and Parius got a good look at the man. He was tall, and built. He had unkempt black hair. Parius couldn't see his eyes. The man then barked at him to get up. Parius sat there, unsure of what to do. The man grabbed him by the front of the shirt, and pulled him up. He said that he would give him a chance to join them, as they took in homeless sould. But, they have to prove themselves, by winning a fight. Parius did not know if he wanted to do this, but the man never gave him a chance to think. The man threw Parius a few yards away, and demanded 2 Bokken be brought. A couple of boys brought him the Bokken, which were red. He threw one at Parius, and took up a stance. Parius had never fought before, and he tried to explain that, when the man attacked. PArius tried to put up his Bokken, but the man broke it in half, and hit him in the chest, driving the wind out of his lungs. Parius couldn't believe how hard he had been hit. He flew back, and hit a tree. As his vision began to turn black, he man scoffed, and walked away. Parius held out his hand, and passed out. When he woke, he vowed to become stronger, to beat this man, and regain his dignity. So began his time in the Rukongai. It had been 2 years since then, and Parius had been training with a Bokken, desperate to become stronger. He had challenged many people. Some fights he won, but he also lost many. Every battle made him stronger, and changed him. He became a bit more serious, though, at heart, he was still light hearted. Soon he knew that he was as ready as he was ever going to be. He also learned of others who had been attacked by this man. They told him of his name. Kira, the word for killer. Parius told them that he would defeat that man. Many laughed at his face. He never cared. He soon caught up to that man, and challenged him. He suprised him by using his name. Kira laughed, but, seeing Parius was serious, asked for a blade. Parius was suprised, thinking they would fight with Bokken. Kira stated that if Parius was serious, then they should fight seriously. 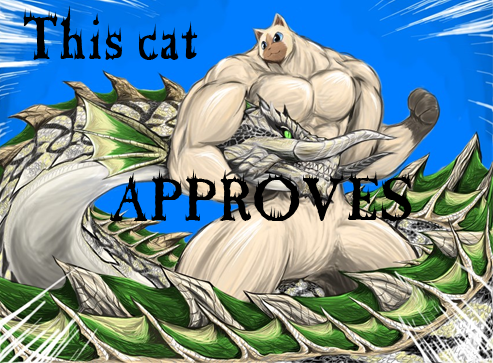 Parius agreed. A katana was brought to him. Kira attacked first, like last time. Parius managed to get his blade up in time, only for Kira to attack again, cutting his shoulder, almost the whole way through. Parius gasped, as he had never felt pain like this. He almost passed out again, but something kept him going. He kept standing, though barely, much to the amazment of Kira. Kira then stabbed at his heart. As the hit was coming, PArius knew he couldn't dodge it. He gave up. But then, a voice in his head said "If you give up, you die. Don't give in, ever. Use your inner strength, and defeat him!" Parius asked for a name, but heard nothing else. That's when he felt an explosion of power, and he felt better. Parius had released his first burst of Spiritual Pressure, and the blast knocked Kira back. Kira yelled at Parius, demanding he explain. Parius answered by stabbing Kira, through the stomach. Kira's eyes opened in surprise, as Parius pulled the blade back through him. Parius explained that he had done enough damage to injure him ,and keep him off his feet for a couple of weeks. But, he also said that if he learned he had bullied anyone else, like he had with Parius, he would return, and finish the job. 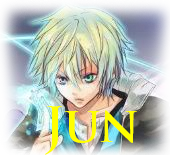 He threw the katana, and it stuck in the ground, in front of the blonde boy, who had hit Parius 2 years ago. The boy walked up to Parius, and told him his name was Lee, and he was sorry for hitting him. Parius smiled, and accepted it. Lee asked Parius if he could come with him. Parius said yes, but asked him where to start, as he still had no idea where they were. Lee said that they could find jobs, then get a house. Parius agreed that it was a good idea, and they set off to take on the Rukongai. Some years had passed, and life was good for Parius and Lee. Parius had gotten a job keeping the fires hot in a blacksmith shop, and Lee worked at a tea shop. They had bought a house, and, soon had many other friends, some of which stayed with them. The house wasnt much, but it worked. The only thing that looked expensive, was a katana, with a dragon wrapping around the sheath, on a stand, by their fire. Parius got this when he had convinced an annoyed customer to keep buying from his shop, when his order was mixed up. In gratitude, the owner gave this to Parius. Many Shinigami passed through the tea shop where Lee worked, and Lee heard the stories of brave Shiningami, and the Gotei 13. Lee came to the house, and said that one day, he too would join the Gotei 13. Parius and all their friends wished him luck, and threw a big party to celebrate. Lee eventually asked Parius if he would join with him. Parius said no, and explained why. Ever since his fight with Kira, Parius wanted to remain as care-free as possible. Lee was dissapointed, but didn't press the issue. That's when they heard a scream, from the clearing where Kira usually was. Parius looked at Lee, and bolted out the door, grabbing the katana. When he got there, he found Kira, and his gang, dead. Parius looked away, in disgust, when he was knocked in shoulder. The blow knocked him through the air. When he landed, he managed to look. He saw a monster, like the one when he was attacked in the Human World. Lee had instructed Parius about them. He now knew they were called Hollows, and that eat souls. This one looked like a lizard, but with white armor on each of its legs, like bracers. Its mask was plain, but had 4 spikes arced skyward. He knew thats what had happened to Kira, and grew nervous. Then, he heard crying. Looking back, there was a small boy there. Parius knew that the boy stood no chance, so he stood and taunted the Hollow. When it came at him, he looked at the boy, and told him to run, and find the nearest Shinigami. When the boy ran, Parius turned his attention back to the Hollow. He thought back to Lee, and all his friends. That's when he felt the same explosian of power from 55 years ago, when he fought with Kira. He attacked, and managed to hit the Hollow, but it seemed not to do anything, when its tail whipped, and hit him again. Even with that explosian of power, Parius couldn't beat the Hollow. He knew he was finished, when a cut appeared on the Hollow. Parius looked around, and saw a man, in Shinigami clothing. Then he realized he recognized him. This was the same Shinigami that performed the Soul Burial on him. He got a good look at him this time, though. He was very muscular, and had purple, slicked back hair, that he had put into a ponytail. 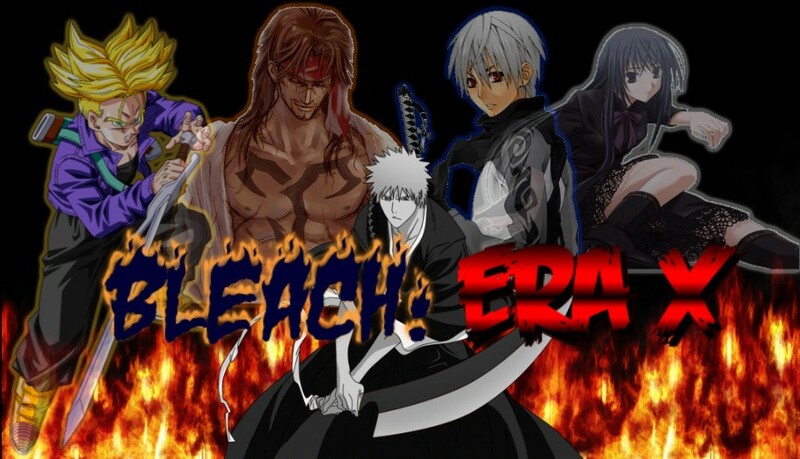 He wore the standerd Shinigami uniform. Parius was shocked, and asked the Shinigami's name. He didn't answer, and proceeded to attack the Hollow, managing to break its mask in one hit. The Hollow runs, and dissapears. Parius began to get up, only to be kicked down by the Shinigami. Parius yelled at him, asking him why he was keeping him pinned down. 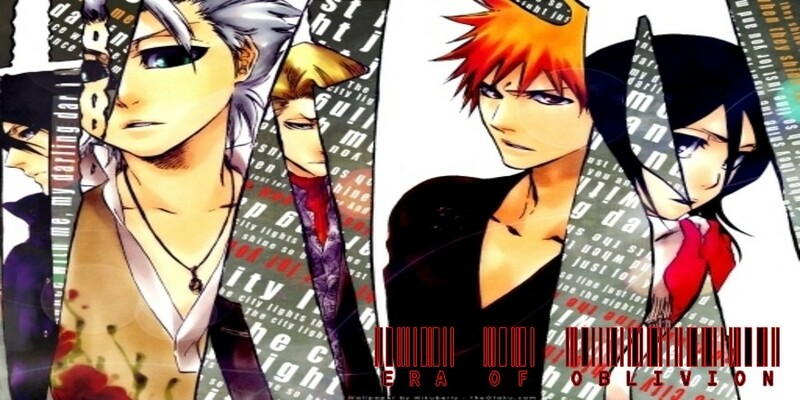 The Shinigami only looked at him. Then he dissapeared. Parius looked around, but couldn't find him. So, he picked up the katana, sheathed it, and went home. Parius found himself at the Kira's old grounds. Bodies were everywhere. One limp form, he recognized. It was Lee, a katana by his side. Parius ran up to him, and found that Lee was still breathing, though barely. Parius shook him ,asking what had happened. Lee said one word, which shook Parius to the core. Hollow. Parius wondered where the Shinigami were, when Lee told Parius to hold on, and never forget who he was. Lee died, and Parius lost his one, true friend. After mourning, Parius heard a sound. Picking up the katana, he turned to it, only to see the lizard hollow, though it was bigger, and had more spikes than before. Parius, first felt fear, then, a white hot rage overtook him. He drew his katana, and faced the creature. Parius joined the Soul Society almost a week after that day. He swore to live up to Lee's ideals, and made it through the training, which was hard. He graduated, though not at the top of his class. He didn't so well with Kido. He also learned his Zanpakuto's name. Anokoku. Parius joined a squad, Squad 11 to be exact. It didn't take him long to make friends. Among them was Jensen Reinhart, and Kurama. Jensen soon rose to Captain rank, and Parius transferred over to his squad. Parius rose to Vice-Captain, and made a good impact on people in his squad. However, Parius soon gained an inner Hollow, named after his old friend, Lee. Parius became a Vizard, and left the Soul Society, before he could be kicked out. He knew his friends weren't going to like it. But, Parius left with a smile, and forged his own path. Sometime, Parius got the nickname, the Black Dragon. He liked it, and kept it. He soon grew attached to traveling, and kept doing it, sometimes visiting the same places. however, Parius loved going to Japan more than anything. However, in New York, he challenged Jensen's son, Ashen, and lost. he joined the Endless, a group of Vizard's. He soon left that Organization, in Order to head up his own, known as the Vanguard. Added abilities, and changed Bankai appearance. 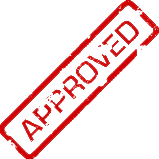 Abilties 5, 6, and 7, approved. Would like Bankai approved, and made small changes everywhere, as well as adding new pics. Bankai ability questions will be associated with your numbered abilities, like 2. will be matched up with 2. on your abilities. We've already discussed how the shikai dragon wave thing is underpowered. 2. So this takes up most of your energy too, just in five separate, blasts? This kind of makes the shikai version useless really, especially since it's like a trump card in your shikai. I would do something else with the shikai version and keep this one as a trump. 3. I'd like the bounced attack, if succeeded, to be half the speed as well. 4. Is just as underpowered as the shikai version. 3 post cooldown if used as a blast equivalent to a Gran Rey, 4 for the stat boosts version, since those last 3 posts. As is, it doesn't need the one use per thread, nor breaking your bankai. Maybe fatigued state if you use the boosts version. Took out my clone, dark ball, and and five way shot, in Bankai. Added new abilities in their place. also made the BDW More powerful. There's definately more detail than when you first made him. I think your good enough for 1-5, but I wouldn't mind a second oppinion. Anyway, mods approved. Added one new ability. Darkness Manipulation. Teleport needs CD or limits to use in a certain period of posts or a limit to thread. He can spam it as is and thats auto denied. You need to chose one or the other. Intangibility or Banishment of an Energy Ability. This currently makes energy abilities, which would hit your intangible form, from being unable to do so. Making you literally invulnerable for that post. You know how I despise true invulnerability. This is more of clarification than fixing. Shikai power of 6 orbs at once = one full cero total = each orb being at 1/6th cero power. This means that 9 in bankai = 3 full cero total = each orb is 1/3rd the power of cero. If this is true then your words are correct and nothing needs be changed. If this is not true then you need to re-word your ability. That is too powerful for a shikai move. Especially considering how many abilities you have at your disposal at any given time. Dim this to at LEAST a Cero and a Half and I'll be good. That is a horribly spammable reflection attack. Fix this. You have a final move in Toukai and that is what this ability is as well. You cannot have two final moves. Nerf this or removed it. It pulses out, burning and cutting anything in it's path. .....how strong is this? you give speed but no power. Alot of your abilities need to be dimmed down in terms of power. Not because they themselves alone are overly powerful but because both of your weapons have powerful abilities that DO NOT SHARE cooldowns. So instead of dealing with one ability doing a gran rey worth of damage someone is dealing with the very real possibility of TWO gran rey cero's at the SAME time. That is very very powerful. Edit: In TOUKAI, you could state which abilities RETURN to being Gran Rey powered though. It is now a non-combat ability. Took the intangible ability out. Likes and Fears are not filled out. Abyssal Corrosion: How long does the burning last? Steadfast Leap: What's the exact AOE? Has to be decent to warrant a one post cd. What about the charged up version? What is that one's strength? Or is it that 3 cero's worth? Oh, on both this one and the Abyssal Corrosion, how long does it take to charge? Corrupted Dragon Wave: Try five at minimal for 2 gran rey strength. Probably six, since it's a single blast and not two separate shots. Abyssal Shift: Is this 8 times a thread or eight times before a cooldown? I would prefer thread. Shield of Black Magik: Five or six post cd. In case parius doesn't get to it. I did confirm from him that it is 8 times a thread. Because I told him that if he didn't word it that way it could get denied for being OP. I also warned him he may have to state it doesn't work on finals.